Western philosophers of mind and phenomenologists to explore issues about consciousness and selfhood from these multiple perspectives. Self, No Self? is not a collection of historical or comparative essays. It takes problem-solving and conceptual and phenomenological analysis as central to philosophy. 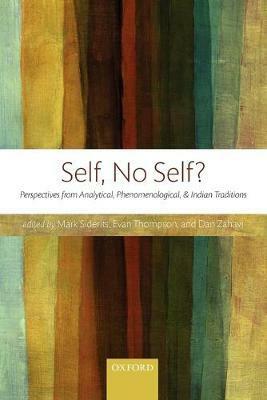 The essays mobilize the argumentative resources of diverse philosophical traditions to address issues about the self in the context of contemporary philosophy and cognitive science. Self, No Self? will be essential reading for philosophers and cognitive scientists interested in the nature of the self and consciousness, and will offer a valuable way into the subject for students. Mark Siderits is Professor of Philosophy at Seoul National University. He received his BA from University of Hawaii and his Ph.D. from Yale University. His work is situated in the intersection between analytic metaphysics and classical Indian philosophy. He is the author of Indian Philosophy of Language (Kluwer, 1991), Personal Identity and Buddhist Philosophy: Empty Persons (Ashgate, 2003), and Buddhism as Philosophy (Hackett, 2007). Human Experience (MIT Press, 1991). currently co-editor in chief of the journal Phenomenology and the Cognitive Sciences. In his systematic work, Zahavi has mainly been investigating the nature of selfhood, self-consciousness and intersubjectivity.